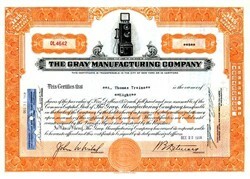 Beautifully engraved certificate from Gray Manufacturing Company issued in 1960. This historic document was printed by the E. A. Wright Banknote Company and has an ornate border around it with a vignette of an early pay dial telephone with the candlestick mouthpiece. This item has the printed signatures of the Company�s President and Treasurer, and is over 45 years old. 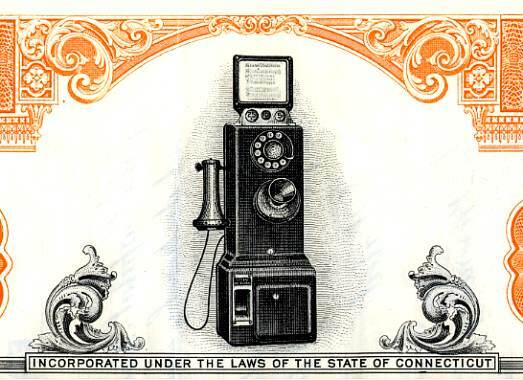 The first pay phones in the United States were manufactured by the Gray Telephone Pay Station Company of Hartford, Connecticut. In the 1920's, the coin phones gained wide acceptance. Originally, they had a transmitter mounted on the front and a receiver on the side, but by the 1930's they were changed to use a handset. Bell System bought their 3-slot pay phones from the Manufacturing Company. In 1934, Bell System announced that it would no longer buy pay phones from Gray because the patents had finally run out and they could make their own at Western Electric.